The demand at the water refilling stations – water stores that sell purified water – is now increasing. The quality of purified water conforms with the national standards for drinking water and is even better than the quality of water produced by traditional water supply systems in terms of removed impurities. Over the years, as the demand for cleaner water becomes higher, the price of household water purifiers and bottled water has become prohibitive. Water refilling stations managed by private entrepreneurs offer a cheaper and more convenient solution to the public’s drinking water needs than bottled water or the use of household filters. At present, about 3,000 water refilling stations have proliferated nationwide. They sell purified water of comparable quality with bottled water at a lower price. For example, the current price per gallon of refilled purified water in Metro Manila ranges from P 50 to P 120 per 5-gallon container or about P 2.50 to P 6.00 per liter while the bottled water is sold at P 12.00 to P 25.00 per liter. Household filters, on the other hand, cost P 5,000 to P 25,000 per unit ( 1 US $ = P 56 in 2004). In Metro Manila, most of the water refilling stations are connected to the pipes of two concessionaires: Maynilad Water Company or Manila Water Company for their source of raw water while in other areas they opt to use private deep wells. The “potable water” supplied by the providers is then further purified by utilizing a combination of water treatment equipment, such as sediment filters, carbon filters, water softeners, reverse osmosis membranes, ultra-violet lamps, and ozone generators. Typical water refilling stations can produce 3,000 to 12,000 litres of purified water per day. In previous years, most of the people were bringing a container to a water refilling station to buy purified water. Nowadays, because of convenience on the part of the consumers, purified water in 5-gallon (22.7 litres) containers are delivered by the station directly to the people’s home. Aqua Sure, a water refilling station in Metro Manila, can deliver 5,500 gallons (25,000 litres) a day to its 8,000 household clients. Structurally, water refilling station can be operated with a minimum area of at least 20-25 square metres. It comprises the following sections: refilling and selling room, enclosed water purification room, container washing and sanitizing room, storage room for empty and refilled containers, source water storage facility, toilet and an office. To operate the water store, about five employees are needed. Multi-media sediment filter – removes sediments such as rust, sand and particles that are invisible to the naked eye; employs a total of 5 filters. Ion exchanger – replaces hard minerals with soft minerals. Activated carbon filter – removes all organic chemicals, herbicide, pesticide, offensive odor and bad taste. Reverse osmosis membrane – the heart of the system and the most expensive unit; removes inorganic minerals, bacteria and viruses while retaining its oxygen content. Since the filter size is very small at less than 0.05 micrometre, the product water could have a total dissolved solids (TDS) of less than 10 ppm. The filtration process rejects about 50 percent of raw water volume. Post-carbon filter – improves the taste of water. Ultraviolet lamp – ensures that the water is free from disease-causing micro-organisms. Ozone generator – inhibits the growth of bacteria in the product tank and prolongs the shelf life of water. The efficiency of water purification system in removing impurities is high. The 10 water quality parameters measured by Magtibay (2001) showed an average of 80 percent efficiency. The Department of Health (DOH). DOH is the main agency responsible for protecting the health of the people. The Sanitation Code of the Philippines mandates DOH in protecting drinking water quality. Consequently, DOH issues implementing rules and regulations prescribing sanitary standards for water supply systems, including water refilling stations. The Center for Health Development (CHD) is the regional branch of DOH. Its main function is to provide technical assistance to local government units and to monitor DOH programme implementation which includes water quality and sanitation standards. For water refilling stations, CHD is mandated to issue initial and operational permits. The Local Government Units (LGUs) are mandated by Presidential Decree (PD 856) to issue sanitary permit, sanitary clearance, health certificates, certificate of potability, drinking water site clearance and closure order (if necessary) and to conduct sanitary inspection of WRS. 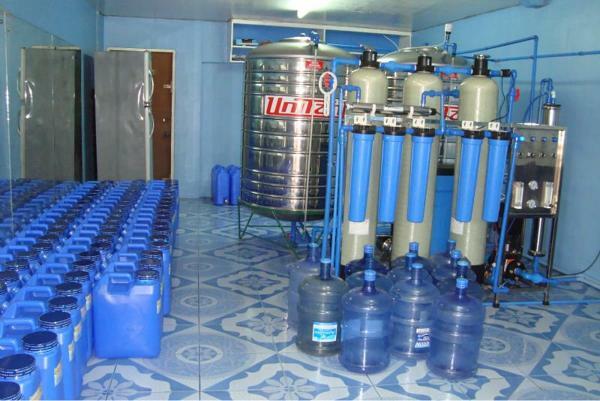 The Water Quality Association of the Philippines Inc. (WQAP) is an organization of private firms who are engaged in the manufacture, sale, and distribution of water refilling station equipment and supplies, as well as water treatment and purification equipment and technology for household, institutional, commercial and industrial applications. About 85 percent of its 250 members operates water refilling stations. Association of Water Refilling Entrepreneurs (AWARE) concentrates on resolving business management issues of its members. Presidential Decree No. 856 (PD 856) or the Sanitation Code of the Philippines is the main law requiring all establishments to comply with existing sanitary standards to protect public health. Guidelines for operating a water refilling station are indicated in the Supplemental Implementing Rules and Regulations on Water Supply of PD 856 issued in 1999. Monitoring of radioactive contaminants shall be done only if there is significant input of radiation from the surrounding environment. Water refilling stations can be a good source of safe drinking water in the Philippines. Purified water can meet the aesthetic standards easily detectable by the people in terms of taste, odor and color. The efficient water purification processes can make the quality of water superior to the traditional water systems. However, the risk of contamination is possible if the handling practices are not closely monitored. what filters do i need if i do have a very clean sweat drinkable well water ,,depth of well is 140 meters…. Water Refilling Station is a promising and profitable business today. I visited and contacted this website http://www.waterrefillingstationfranchise.com and they have an option to be a franchise or not. Good deal coz if you have a low budget you can still open a refilling station. Start your own Water Refilling Station Business! Guaranteed NO FRANCHISE FEE, NO ROYALTY FEE, NO MARKETING FEE! ORCA Applied Engineering Solutions Corp. is offering a Water Refilling Station Package – including the DOH-approved Water Treatment Equipment, DTI Business Name Registration, Proposed Site Lay-out, Installation, Staff Training, Water Containers, Seals, Heat Gun – with 20% Discount! This offer is open nationwide. Contact us now at (0948-8560228) to schedule your FREE ORIENTATION on HOW TO START A WATER REFILLING STATION BUSINESS! where can i find a water refilling station management software or system?